James Reimer will always be Optimus Reims, but the Transformers-inspired nickname takes a backseat to a team theme on the new Florida Panthers mask he shared with InGoal Magazine. Painted once again by Reimer’s long-time artist, Dave Gunnarsson of DaveArt, the new mask features familiar staples, with the leader of the Autobots shown in two forms on either side, as well as on the chin, below his nickname “Reims.” While the Optimus Prime theme remains on this otherwise Panther-heavy paint job, it’s a departure from past masks, including his brief stint with the San Jose Sharks, that “transformed” Reimer himself into Optimus, with exhaust pipes coming out on either side. 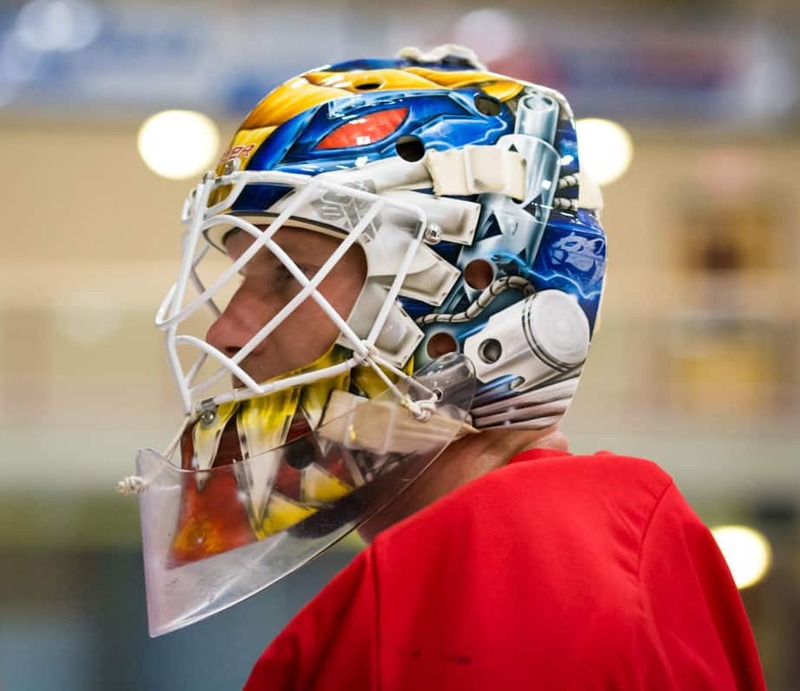 Reimer was wearing a Panthers version of that style mask last season, when InGoal was on the ice with him at NET360 Camp this summer (photo), and earlier this season. As for the biblical backplate, that has been a constant on Reimer’s masks, one that even predates the Optimus references. This version includes the initials of his daughter Nevaeh (“Heaven spelled backwards,” said Reimer), who recently turned one, as well as two bible verses. You can see some of the past bible references from our first story on one of Reimer’s masks from way back when he first came up with the Toronto Maple Leafs, which also included a reminder from an old goalie coach on the backplate. (click here to read). Stay tuned for more from the locker room with Reimer, including an interesting equipment modification. When does a goalie ever look at the front of his/her own mask? Optimus Reim is for the fans. The back plate is the last thing you see before you put it on and get down to business. That’s where the important things go.